A couple of months ago I wrote about an entire neighborhood that had been demolished north of the Capitol building in order to build parking lots. Today we are going to shift our gaze to the south, to yet another neighborhood that was bulldozed over, though this time for a higher purpose. This photo is of the White House Hotel, one of Carson City’s forgotten lodging establishments. 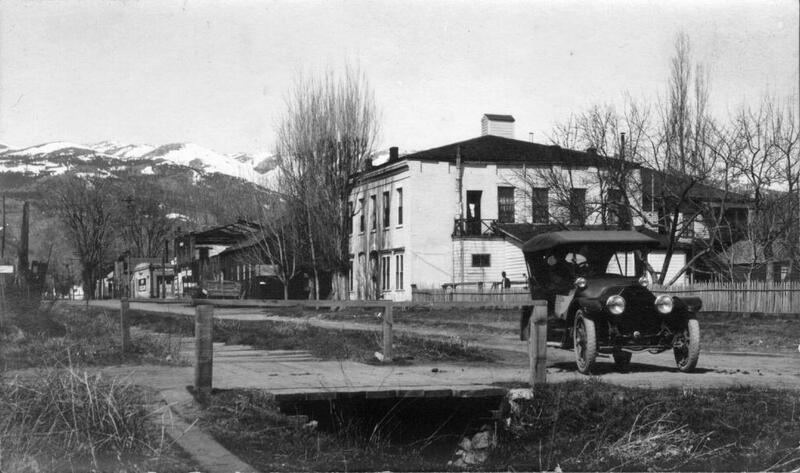 Unlike the St Charles Hotel, which has survived though more than 150 years of history, or the Ormsby House which got a second life through being rebuilt, the White House was one of many hotels that used to serve Carson City and its visitors which has been completely erased. The hotel was located at Third and Plaza Streets, just two blocks south of the Capitol grounds and one block off of Carson Street. This view looks at the hotel from a block away, at Third and Fall. A large drainage ditch runs along Third Street, with Fall Street crossing the ditch on a small bridge. A Model T seems to be deliberately posed by the side of the road for the photo. In the background you can see many more commercial buildings stretching along Third Street. 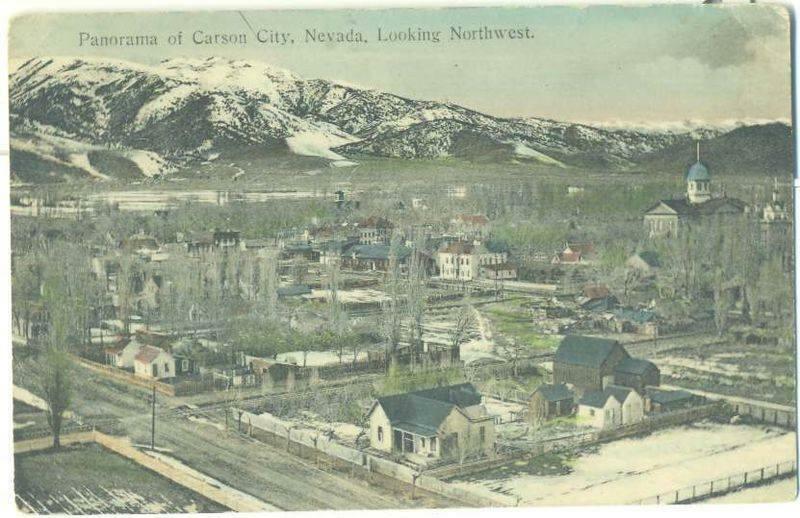 When Carson City was first founded, Abe Curry set aside four blocks at the heart of town for the State Capitol Building. This was an act of pure hubris, since there was no indication this small town would ever be important enough to become the state capital. But within a few years, through the influence of Curry and others, it had become just that, and the Capitol Building was built on the land Curry had set aside for it. The town grew around the Capitol, with houses and businesses butting right up against the iron perimeter fence. This postcard shows the neighborhood to the south of the Capitol. The White House Hotel gleams in the center of the photo, surrounded by several blocks of tree-lined streets and houses. This neighborhood’s days were numbered, though. The early State government was able to all fit within the small stone Capitol for a while, but by the 1950s more space was needed. A plan to demolish the Capitol and replace it with an office complex was wisely shot down, so instead they looked at expanding the Capitol grounds. They determined that the most natural place to expand was into the neighborhood to the south. The first expansion was the Nye Building, which can be seen at the center of this photo. This was built in the 1950s, with it and its parking lot taking up two of the neighborhood blocks. The White House Hotel can still be seen, to the left of the Nye Building, and the rest of the neighborhood was still untouched. But not for long. In the 1970s the State got much more ambitious in their expansion. They designed a new State Legislature building that would occupy four blocks at the corner of Fifth and Carson. They bought up all this land and demolished the neighborhood that had been there. The White House Hotel was torn down, along with many other houses, and even some buildings that dated back to the 1860s. This was destruction on a massive scale, the erasure of an entire neighborhood all in one blow. Demolition on this scale probably wouldn’t go over well today. The forces of preservation are too strong. But in the 1960s and 1970s this was seen as progress. 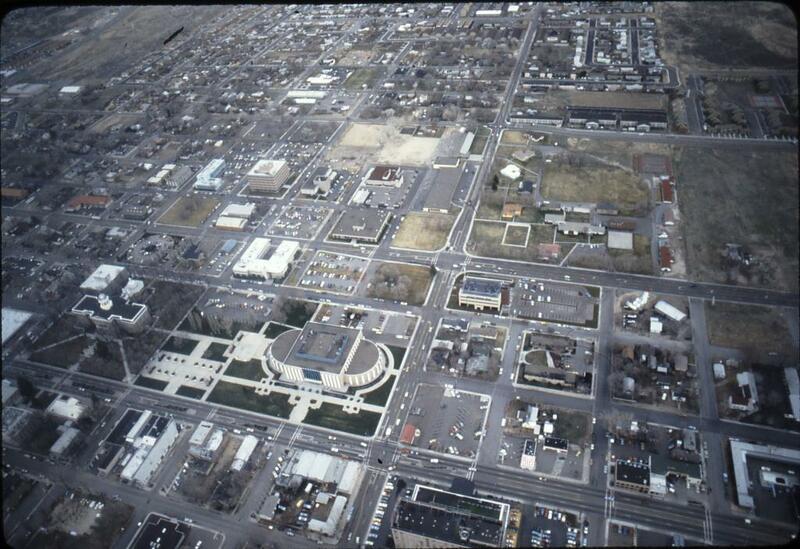 This aerial photo shows the new Legislature building sitting on the land the neighborhood used to occupy, along with a new “Capitol Plaza” between the Capitol and the Legislature. That plaza is the former site of the White House Hotel. Today, all traces of Third Street and the hotel are gone. This view of the Capitol Plaza is taken from the former intersection of Third and Fall, looking towards Carson Street. 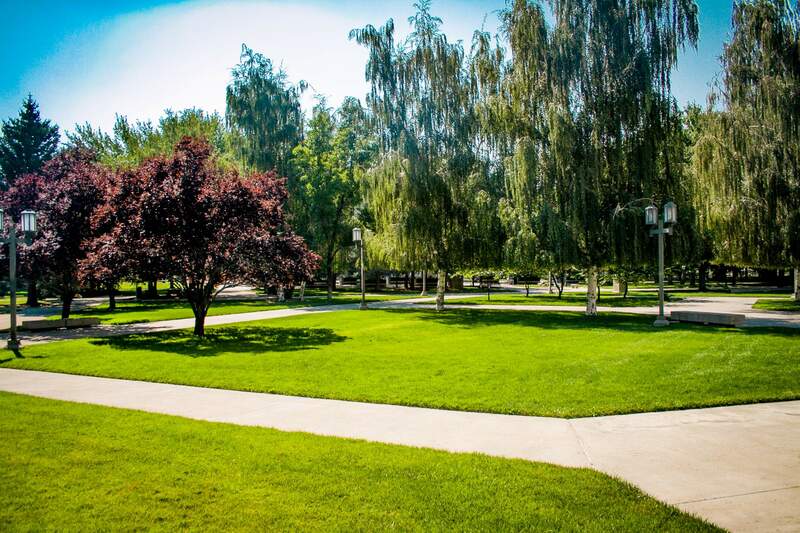 The street grid is gone here, replaced with meandering pathways, grassy areas, and statues dedicated to Carson City’s founders. Some time ago I head from someone claiming to have memories of the White House Hotel. 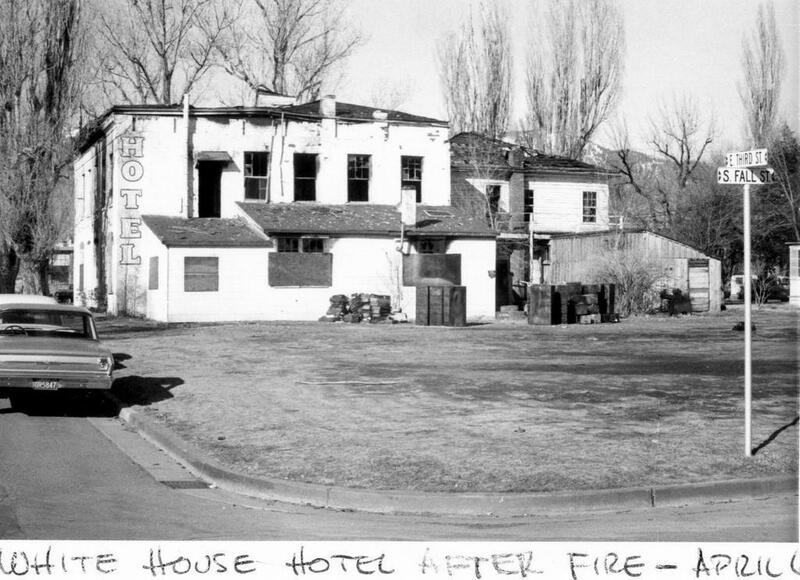 The White House Hotel in Carson City, was owned by my Aunt (my mother’s sister), and her husband during the 50’s and 60’s until the state of Nevada bought the property and sadly, tore down the hotel for a parking lot. Their names were Marie (Lamb) and Conrad “Whitey” Strauch. Both were professional gamblers that had previously owned the Alpine Lodge and then the Sierra Lodge (which they built), at North Shore Tahoe. As you entered the front door of the hotel, the room immediately to the right was “General Grant’s room”, which I frequently occupied. The room to the left just inside the front door was “Jenny Lind’s room”. Both were so named as at some time in history, each of them had stayed there more than once – reportedly. Directly across the street from the front of the hotel lived “Frenchy” LaBorie (sp? ), who was a long time resident of Carson City and theater projectionist. He used to take me fishing at the Carson River on many occasions. I hope we’ve reached the point in Carson’s history where this kind of large-scale demolition is in our past. Unlike many cities, our downtown and the neighborhoods around it have survived the decades with only small changes. We have lost some parts of it, like this neighborhood, but from those losses we have learned to preserve what is left. Let’s remember Third Street, and the White House Hotel, and not let that happen again elsewhere. The White House Hotel “after fire”. This seems to be the late 60s, so maybe this fire was the end for the hotel. All of this was demolished soon after. 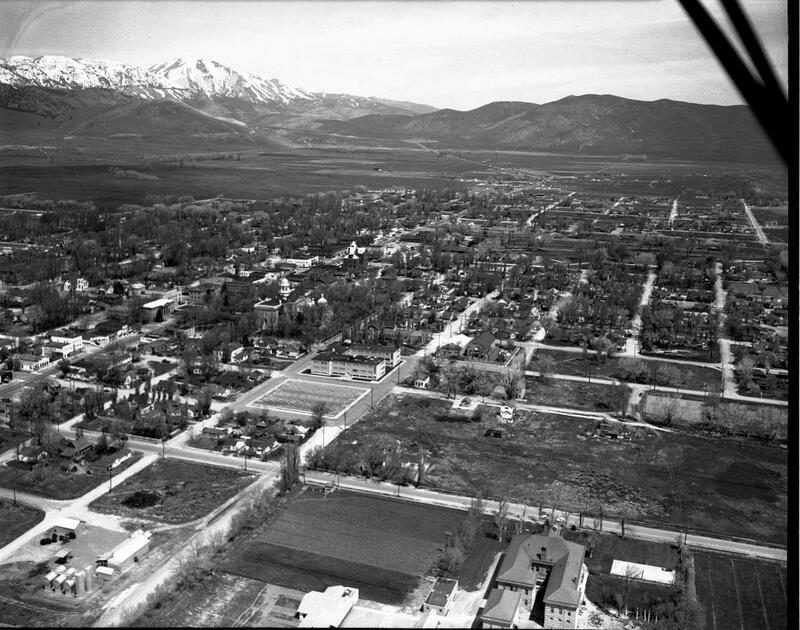 A progression through time, aerial photos of the neighborhood as it was swallowed up by expansion of the Capitol grounds. 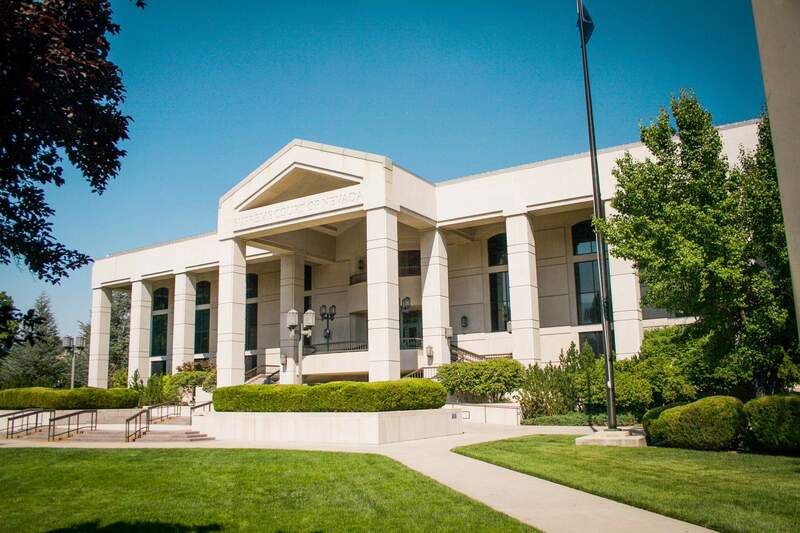 The “now” photo was taken from the front of the new State Supreme Court building, built in the 1990s on the site of the Nye Building. Its front porch sits very near the former intersection of Third and Fall. fantastic photos and information. I was born in a house on walsh street, and lived there from 1945 until apx 1950. we moved to, what was later named sage street. before that, our mailing address was “rural rout 1 carson hot springs road”. our mail boxes were on the other side of 395.